It’s In The Bag! Duffle Bag tutorial and pattern, makes a great gift. Making a Duffle bag is part of our It's In The Bag blogs. The previous Blog was focused on making a wash bag. The wash bag could be suitable for a makeup bag, a football boot bag or even a lunch bag as it can fit a small flask in with ease. This duffle bag tutorial is easy but will take a bit of preparation before you start. The types of duffle bags you can create using this pattern all depends on your fabric choices. This is a soft duffle bag and so can carry a lot, is strong but it can fold into a small bundle to be packed away when not in use. Ideal for caravaners, campers, and travellers. Please look at this Blog on Bag suitable fabrics as we can use a lot of these to create Duffle Bag masterpieces. Most of the Duffle bags we found when searching the Internet were really nice, in bright colours, washable, waterproof PVC or the like, very suitable for ladies. We thought we would make a duffel bag more suitable for a gentleman using a mixture of woollen cloth and waterproof cloth with a nice padded, quilted lining. You may choose any medium to heavyweight fabrics for your duffle bag as long as your sewing machine can sew through the layers. Sewing through thick layers of fabric, upholstery fabrics, denim, layers of thinner fabrics on a seam can be very difficult on some sewing machines. I used a microtex sharp, 100/16 needle to help me. Choose the fabrics you are going to use and decide if you want to use webbing for the handles or if you want to use the same fabric as the bag. This duffle bag tutorial uses the same fabric as the bag. 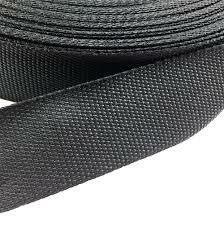 Webbing is commonly found made from cotton, nylon, polyester and polypropylene. For the handles use webbing that is at least 4 - 5 cm wide. All webbing will unravel if the ends are not secured or finished in some way, so using a lighter or candle flame burn and melt the ends. Webbing is woven so a Microtex sharp or universal needle 80/12 is your first choice of sewing machine needles. It is advisable to sew both edges of the webbing to the fabric, sew as close to the edge of the webbing as you can. Overlap joins, secure by sewing a block with a cross in it around and through the join overlapped webbing. Chunky plastic zips feature teeth that are made of plastic that are moulded onto the zipper tape. This construction makes them strong and practically weatherproof. Available in a number of types and styles such as open-ended, closed-ended, 2 way and heavy duty. 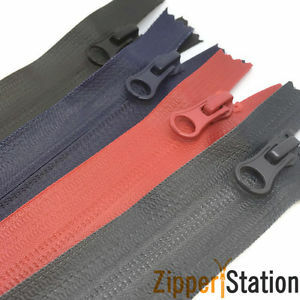 2-way zippers used in clothing and accessories that allow a garment, bag or cover to be opened or closed from two directions at the same time. As with other sorts of zippers, it can come in metal or plastic. Waterproof Zips have a coil zipper with a water repellent tape, great for outdoor wear, bags and any other item subject to the elements. Cut two pockets out of main fabric – 27cm X 32cm - measure with your ruler and cut these. Then cut two pockets out of lining fabric – 27cm X 32cm - measure with your ruler and cut these. On a fold cut four straps – 43cm X 12cm each strap should measure 86cm X 12cm when opened. Measure and cut two tab strips – 15cm X 8cm - measure with your ruler and cut these. 1X 58cm zipper with large teeth. Pins, scissors or rotary cutter, sewing machine. Newspaper or brown/white paper to draw out your pattern pieces. Draw the pattern on brown paper or newspaper. Duffle bag pattern: See cutting out above. To make a solid colour duffle bag. Cut one main fabric piece on a fold. The lining should also be placed and on a fold, cut one. For contrast, main fabric bag i.e. top one colour, bottom another. Cut on the dotted line which is halfway and add 1cm to that edge on both pieces. Cut the bottom piece on a fold, cut two top pieces. Sew these two pieces together using a 10cm seam allowance. Check you have all the pieces before you start sewing, remember to cut the tabs and pocket pieces to the measurements given. Sewing the straps for our Duffel Bag. Step 1: Sew the strap pieces together. Label each piece strap 1, strap 2, strap 3, strap 4. Place one end of strap 1, right side to right side with one end of strap 2. Sew a 15mm seam. Next put the other end of strap 2, right side to right side with one end of strap 3. Sew a 15mm seam. Putting the other end of strap 3, right side to right side with one end of strap 4. Sew a 15mm seam. Join the other end of strap 4, right side to right side with the other end of strap 1. Sew a 15mm seam. Step 2: Fold the strap in half lengthways and iron. Step 3: Fold the edges 1cm towards the middle. Iron flat. Step 4: Fold in half, and pin the folded side seams together. Sew around each edge to turn it into a secure strap. Set it aside for later. Making the "Tab Pulls" for either end of the zipper. Cut the tab piece fabrics out. Step A: Fold in half lengthways and iron. Open up and fold each edge to the middle and iron flat. Step C: Sew around the edges to secure. I have only put two large pockets between the straps on either side of the bag. You can, however, put pockets on the lining pieces for more pocket space inside. That is entirely up to you. Step 5: Lay the main pocket fabric flat, place a lining on the top right sides to rights sides and pin. Sew the top seam 10mm, flip fabric and iron flat. You should now have raw edges on the sides and bottom. Step 6: Lay pocket piece right side down and fold bottom seam over 15mm and sew a row of straight stitiching to hold it in place. The side seams will be included with the strap handles. Step 7: Open up your main bag fabric piece and lay it flat, fold in half lengthways and place a pin on the fold. Fold width ways and do the same. Fold the pocket in half side to side and place a pin on the fold. Step 8: Place the pocket approx 15cm from the top edge matching the fold lines for the lengthways fold and the side to side fold of the pocket. Pin in place. Do the same for the other side pocket. To make sure both pockets are in the “same” place. Measure the distance from the width way fold to the bottom of each pocket piece. The straps hold the pockets in place and go round the complete bag body giving it a lot of strength and stability. Step 9: Your main fabric should be laid flat showing the pinned pockets. The strap has joins where you sewed them together, we are now going to use these joins as markers to place the strap. Each “join” should be Placed approx 0.5 to 1cm above the top side of the pocket. Pin it in place so that one side of the strap lies 1cm over the edge of the pocket sides, and continues across the base of the bag and up to the other pocket. See pictures. Step 10: Start one side, sew the side of the strap which overlaps the pocket first. Ensure you sew close to the edge and catch the pocket side edge as well. Once you get to the other pocket top secure with a reverse stitch. Repeat this seam but sew the second row of stitching about a foot width from the edge. Step 11: Start on the same side as above, sew the outer side of the strap in the same manner as step 10. Repeat these two steps on the other side of the pocket. Step 12: At the top of each pocket where the stitching for the handle begins, sew a few rows across the strap to ensure it is secure. Step 13: Sew 2 rows of stitching along the bottom of the pocket between the straps. Step 14: Lay the zip face down on one of the 52cm sides of the main fabric. Pin securely and sew using the zipper foot on your sewing machine. Step 15: Press back from the zipper teeth and top stitch the fabric using stitch length 3. Step 16: Lay the main fabric flat and place the other side of the zipper face down on the other side of the 52cm side and repeat the steps above. Place the zipper tabs on either side, lining up the zipper teeth with the middle point of the tab. Carefully stitch these in place, the zipper teeth can break your sewing needle if you hit them so go slow and between the teeth. Step 17: Lay the fabric flat on the table and carefully match the side seams. Pin together and sew a 10cm seam with two rows of stitching as we do not want this seam to come undone any time soon. Step 18: Make sure that the zipper pull is open a bit. Step 19: Starting at the bottom open the cut sections and match them up to sew across, creating the sides of the bag. Pin together as straight as possible. Repeat this with all for corners. Take care to ensure the tabs are lying flat against the zipper to the inside. Sew each closed with two rows of stitching 10cm seam. See pictures. Your bag is now complete except for the lining. This has to be sewn in by hand but it is not a long or difficult job. Step 20: Fold to the wrong side and iron a 10cm fold in the Zip top edge. As we are not inserting a zip here we will use this fold when we attach the lining to the bag. Step 21: Lay the fabric flat and pin the top zip edge together so the fabric doesn’t move. Repeat step 17. Step 22: Repeat step 19. Step 23: Place the lining in the bag wrong sides together. Pin the top folded edge to the stitching on the zipper. Sew to the zipper fabric using needle and thread and a small slip stitch. Your bag should now be complete..